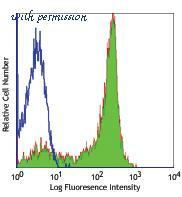 Detection of L-Selectin/CD62L in Human PBMCs by Flow Cytometry. 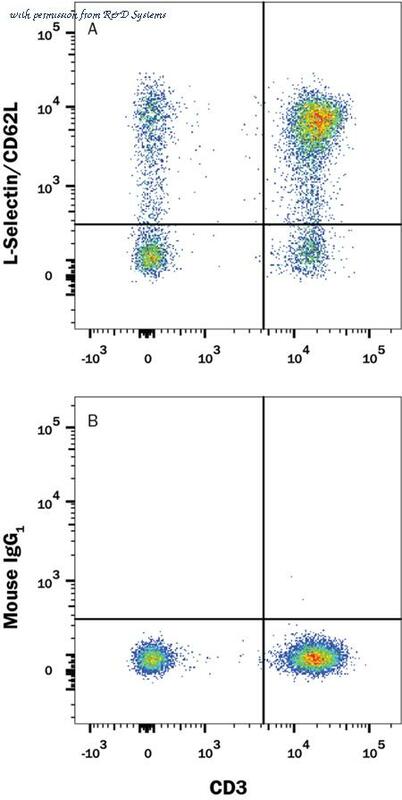 Human peripheral blood mononuclear cells (PBMCs) were stained with Mouse Anti-Human CD3 epsilon APC-conjugated Monoclonal Antibody (Catalog # FAB100A ) and either (A) Mouse Anti-Human L-Selectin/CD62L Alexa Fluor« 488-conjugated Monoclonal Antibody (Catalog # FAB9787G) or (B) Mouse IgG1 Alexa Fluor« 488 Isotype Control (Catalog # IC002G ). View our protocol for Staining Membrane-associated Proteins . Figure 3:Western blot analysis using SELL mAb against HEK293 (1) and SELL (AA:83-186)-hIgGFc transfected HEK293 (2) cell lysate. Flow Cytometry: L-Selectin/CD62L Antibody (DREG56) [NBP1-42795] - Analysis using the PE/Cy7 conjugate of NBP1-42795. Staining of normal human peripheral blood cells with Anti-Human CD4 FITC and Mouse IgG1 ? Isotype Control PE-Cy7(left) or Anti-Human CD62L (L-Seletin) PE-Cy7 (right). 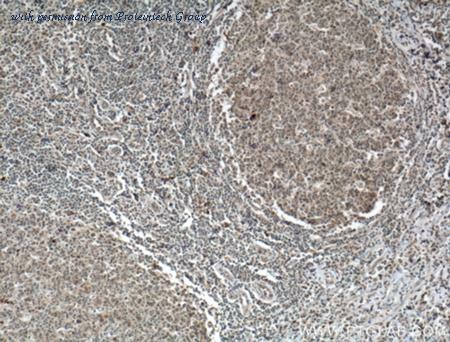 The SELL antibody from Proteintech is a rabbit polyclonal antibody to a fusion protein of human SELL. This antibody recognizes human antigen. 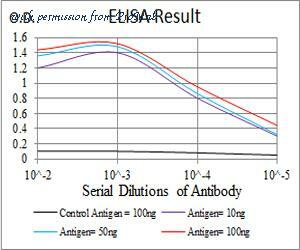 The SELL antibody has been validated for the following applications: ELISA, IHC analysis.